Escaping Ryan: Genoa Mafia Series is a suspense romance novel written by Ginger Ring. Valentina Caponelli, an attorney, relocates to Lake Genoa, Wisconsin to escape her family’s control. Her attraction to Officer Ryan Donovan deepens, but dating a cop is conflicting, considering that her brother, Roman, is a mob boss. When a killer terrifies the peaceful town, Ryan and Roman investigate on opposite sides to catch the criminal. However, the latter’s methods for gathering information are illegal. Ryan tries not to let his love for the mafia princess jeopardize his job, but when her life is endangered, he makes a decision that could ruin his career and his chances at happiness with Valentina. 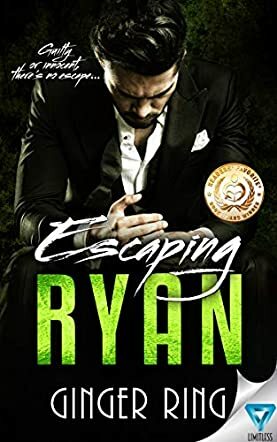 Escaping Ryan is Ginger Ring’s second book in the Genoa Mafia Series involving the Caponelli family and Ryan Donovan. It’s a lovely romance with a suspenseful mystery that had its usual suspects, with the identity of the killer only revealed near the conclusion. Valentina is strong willed with a lively personality. Ryan is reserved but is not a person who backs down easily, especially when he wants something. The romantic scenes are not graphic ones, but I wanted to know more about Valentina and Ryan’s past, how they really met as it’s briefly mentioned. Ginger Ring's writing is engaging and I liked how she started the catchy beginning. This is an easy flowing, suspenseful page-turner that also described Lake Genoa’s beauty and its landmarks. Escaping Ryan by Ginger Ring is an enjoyable book if you’re looking for a light read.